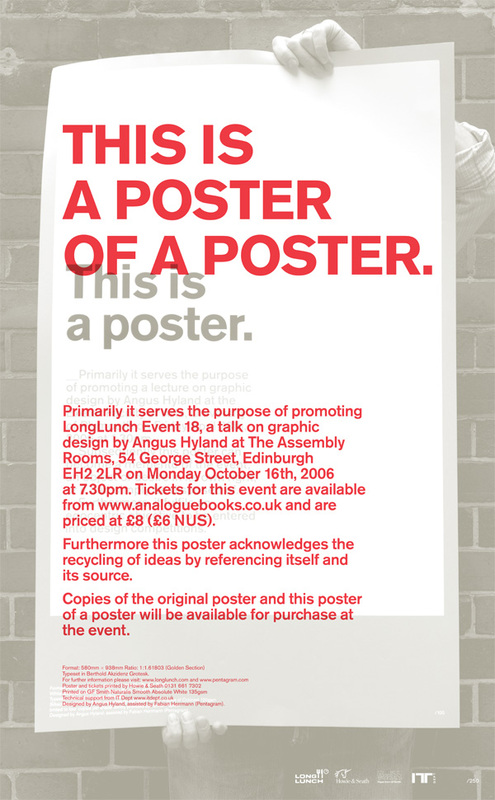 Angus Hyland studied information design at the London College of Printing and graphic art and design at the Royal College of Art. After running his own successful studio in Soho for ten years, he became a partner in Pentagram’s London offices in 1998. Angus’ work has been widely published and exhibited and has received over one hundred creative awards. He also featured in the Independent on Sunday’s “Top Ten Graphic Designers in the UK”. He was the curator of Picture This, a British Council touring exhibition featuring the work of contemporary London-based illustrators, and Ballpoint, an exhibition featuring works by fifty artists created with or inspired by the traditional ballpoint pen.? Angus has edited five books on graphic design: Pen and Mouse: Commercial Art and Digital Illustration; Hand to Eye: Contemporary Illustration; C/ID: Visual Identity and Branding for the Arts (with Emily King); SYMBOL (with Steven Bateman); and his bestselling volume on contemporary illustration, The Picture Book.? He was elected a member of Alliance Graphique Internationale (AGI) in 1999. In 2002 he received an honorary Master of Arts from The Surrey Institute of Art & Design.